2.1 Why Commercial Kitchen Faucets? 2.3 Why buy a professional kitchen faucet? Making the move to commercial and fusion style kitchen faucets is a fun adventure, especially with all of the available models listed below. Only the best commercial kitchen faucets are included on the list, highlighting just how popular these types of faucets have become over the years. At one point it was considered overkill to have one of these in your kitchen, now it is considered chic and trendy to own one, because the touchless kitchen faucets are also trending. It was a necessary turnaround as more buyers were asking for something more powerful to handle the dishes and other materials in their sink. Below is a list of some of the best commercial and fusion-style faucets to buy, or to keep your eye on if you are in the market. Kraus offers full 360-degree swiveling and the hole size requirement is 1.375 inches with a maximum deck thickness of 1.75 inches. It comes in 4 exhilarating colors, and the sensor controls on AC-powered. One of the cool features include ProMotion technology ¾ a combination of a nylon hose and ball joint that offers flexibility. Another commercial-style faucet with a spring and arm. This product weighs 9 pounds as a deck mount install. It is a full brass pull-down hand spray that measures 19 ¼ inches tall with an 8 3/8-inch spout reach, and the flow rate is a powerful and steady 2.2 GPM. The number one item on the list is this medium-priced Kraus that comes in chrome and stainless steel. Notice that the Kraus 1602 features on our top 10 best kitchen faucet list in forth place as well as making it to the best faucets under 500$ list. Buyers can expect a lead-free brass construction with a finish that is resistant to rust and other corrosives. The single lever design offers maximum control over the water and takes full advantage of the heavy-duty design that was modeled after commercial kitchen faucets. Read the full Kraus KPF-1602 review here. The power from the pre-rinse spray is offset by the smoothness that comes from an integrated two-way diverter. You’ll have the option of blasting the water at full power or settling for a subtler approach to the dishes. All mounting hardware is including with the box so installing will be a breeze, even for buyers who’ve never installed a kitchen faucet before. Even with a faucet height of 29 inches, Kraus offers full 360-degree swiveling so that the faucet is never in the way, no matter what. Certification comes from uCPC, NSF, CALGreen, FTC ADA, and other reputable agencies. The flow rate is strong at 1.8 GPM, more than enough for any task that is thrown its way. The faucet hole size requirement is 1.375 inches with a maximum deck thickness of 1.75 inches. Buyers that want a commercial style faucet that can take on the big tasks will be happy with this purchase after weighing all the superior features. Here is the guide to Kraus kitchen faucets with more reviews and listings from this strong brand. This medium-priced faucet from Premier comes in chrome and a very bright PVD brushed nickel. This single-handle kitchen faucet is an industrial style usually seen in upscale restaurants, but is designed specifically for residential use. With the included deck plate, this is a top to bottom heavy duty offering from the company with a ceramic disc cartridge that blows away the competition with its efficiency. It is a certified NSF61-9 product that would look great in any kitchen. With a single press of a button you can change the power of the water from steady stream to a high volume spray to get through pesky dishes easily. It is a large high arching product at 22 9/16 inches and the stainless steel hose protector comes with a wraparound coil. Adding to the power is the 2.2 GPM flow rate that takes full advantage of the hardware and uses it to the fullest extent. Premier recommends pairing this with the optional soap dispenser which is worth the small asking price. This is a great start to the list and will make you happy if you’re looking for something a little different. As one of the highest priced kitchen faucets on the list featuring on the top 10 best high end kitchen faucets, the Kohler Sensate is the definition of modern and comes in 4 exhilarating colors: vibrant stainless steel, vibrant stainless steel with black accents, polished chrome, and polished chrome with black accents. Each color looks stylish on a kitchen faucet, but the colors are just one of many highlights of this wonderful product. Using simple touch controls that respond within 20 milliseconds, this high-tech kitchen faucet can turn on and off by the built-in sensor. The precision activation window monitors to avoid false activation. When not in use, the Docknetic magnetic docking system locks the head into place, eliminating concerns about drooping or loosening. Unlike other high-tech electric faucets, the sensor controls on this one are AC-powered instead of battery-powered. The faucet is of course one of the top picks for the touchless kitchen faucet list. The days of having to hunt for batteries to use in your faucet are long behind you if you select this model. Additional cool features include ProMotion technology ¾ a combination of a nylon hose and ball joint that offers flexibility and a noiseless operation that is one of the best in the industry. The touch control isn’t limited to just the faucet; it extends to the spray head so you can use stream and sweep spraying with very little effort. Sweep spray with this model is particularly powerful and useful for stubborn pots and dishes that are harder to clean. This is one of the most advanced kitchen faucets on the list, and possibly the entire market. Buyers that want a taste of the future of kitchen faucets should strongly consider this model. This higher priced option is another commercial-style faucet with a spring and arm, the same style that has become popular in a lot of kitchens around the world. An easy indicator showing the type of temperature helps consumers control the water better using the one-handed system. Inside and out, this faucet was made to last; it is made of solid stainless steel rather than the cheap mashups of lower grade material. The difference is immediate when compared to brass-made products, the most noticeable difference being the weight. This product weighs 9 pounds as a deck mount install. Compliancy with this system falls in line with the new lead-free legislation AB1953, so green users may be very interested in this product. Although the company isn’t one of the best-known brands, they do offer a limited lifetime warranty against defects in materials and workmanship. One of the nicer features of this model is that the spray and stream button stays in place, even when you turn the faucet off. This ability to remember the position of the button prevents surprise moments when you turn on the kitchen faucet. With all of the commercial kitchen faucets on this list that are becoming popular, this is a pretty special one that makes the cut as one of the best. As one of the standouts on the list, this high-priced device from Blanco shows that you can cram a lot of goodies in one product without making it complicated. There are two awesome looking designs available from the company: satin nickel and chrome. It is a full brass pull-down hand spray that measures 19 ¼ inches tall with an 8 3/8-inch spout reach and 5 ¾-inch aerator clearance. It is the perfect size for a commercial faucet type; the company really nailed it on the design. Flow rate is a powerful and steady 2.2 GPM that will blast off any stains on your pots or dishes that you put in front of it. The company offers a no-hassle lifetime limited warranty against finish, construction, and leaks. Many customers have been satisfied with the speed at which their requests have been answered when something goes wrong, so it is a pretty rock-solid warranty. With certifications from IAPMO and other companies, rest assured that your money is going towards a durable and superior piece of equipment. Bending the faucet gives a good 6–8 inches in reach, which will accomplish most tasks that are needed in the kitchen. As another commercial kitchen faucet that makes the list, this model comes highly recommended. This high-priced Danze kitchen faucet has some simplistic and easy-to-use features that make it stand out on the list. The charm starts with the available colors of stainless steel and chrome, both of which are easily blended into any kitchen décor. A ceramic disc valve powers the one lever design of the unit and gives the consumer full control of the water. If you want smooth one-lever action, then this, surprisingly, has one of the better control schemes on the list. Aerated and stream spray modes are available from the spray, and they’re both easy to use. The spout measures at about 22 ¾ inches high and 10 inches long. For a commercial kitchen faucet, the design supports more of a minimalistic approach and will be the only one on the list that features what could be a compact version of the commercial faucet. Danze has been in business since 2001, so their limited lifetime warranties do hold some weight in the industry and can be respected. Buyers that clamor for the commercial kitchen faucet but don’t want a large overbearing one will love this design and all that it offers. Blanco introduces this high-priced kitchen faucet that boasts one of the best designs on the list for its size. Both the satin nickel and chrome colors really pop in a modern kitchen and stand out from other installed appliances. It has a solid brass body that can take a beating over the years, but is still light enough for easy installation. The ceramic disc cartridge is your standard fare and offers a great amount of support to the operation of the one-lever design. With a 2.2 GPM flow rate, buyers will definitely get all they need and then some when operating this kitchen faucet. The faucet reach is about 8 5/8 inches with a spout height of 7 ½ inches. A lot of the finer details in the design can be missed at first glance, but Blanco really did an incredible job introducing this to the market. An included limited lifetime warranty is considered to be adequate by customers but will cover most buyers just fine. This isn’t the best commercial kitchen faucet on the list, but it might rank high as one of the prettiest. If the design really catches your eye, then it is more than worth the asking price. Probably the highest priced kitchen faucet in the market, this incredible deal is one that many have sunk their money into and been blown away by. With two available colors of SuperSteel and chrome, the former is considered to be one of the best colors available for a kitchen faucet. The incredibly durable Grohe SilkMove ceramic cartridge is the best on the list and really sets a standard for all kitchen faucets. Gliding ceramic disks coated with Teflon guarantee friction-free movement to give the most complete control of water possible, in both temperature and flow. This extra layer of protection also makes it last years longer than competitors’ products as it is resistant to wear. And when considering resistance over time, it is hard not to mention the SuperSteel InfinityFinish, which has been one of the top-rated finishes for years now. Its layered plating process protects the finish from scratches, dirt, and even tarnish so that it looks the same years later even after extended use. The set swivels a full 140 degrees to give you enough room to maneuver, while the flow rate is a solid 1.75 GPM. Besides the dual spray functions of the spray head, the last big feature to mention is the Grohe SpeedClean. SpeedClean is a special technology that prevents the spray head from incurring the wrath of hard water side effects like lime scale buildup. With easy-to-clean silicon nozzles, things become much easier on the design even a decade after installation. This is the best kitchen faucet on the list without a doubt, and should get strong consideration from any buyer. For those interested in Grohe here is our Grohe kitchen faucet reviews. Revisiting some low-priced offers from the industry, this iSpring L8205CHR Single Lever Pull Out Kitchen Faucet brings the commercial faucet to residential homes without stripping it of the charm that made it so popular. Buyers will get a full 360-degree swivel — something that is not common with this type of faucet. If this is a feature that is important to you, then by all means, take a closer look at this product. With the click of a button, you can change from high-volume spray to steady stream, maintaining full control of the entire faucet in the process. Maintenance is at a minimum thanks to the drip-free ceramic cartridge that gives just enough “oomph” to make this a product to keep your eye on. This is a very high arcing faucet, measuring a full 23.6 inches with an adjustable spout reach of 6.7–9.5 inches — one of the longest on the list. It’s a really large unit that is meant for big sinks, so be wary if making this purchase for a smaller sink. Since it has a flow rate of 2 GPM, consumers can expect to be able to get anything off of their dishes with the superior water power of this product. 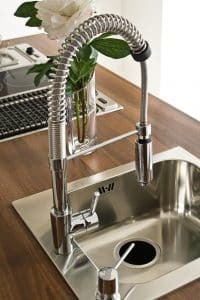 For a kitchen faucet to be this competitively priced and have such nice features is a rarity, and with some key features that make it stand out from the rest of the commercial faucets on the list, it’s a very interesting buy. Last on the list is the high-priced VIGO VG02007ST PullDown Spray Kitchen Faucet available in steel and chrome. The spout height is an incredible 27 inches with a reach of 10 inches, making sure that you never have to worry about being out of reach while in the kitchen. Vigo achieves a contemporary style and captures its essence better than any other product on the list. Included in the package is a matching deck plate to go with the ADA compliant kitchen faucet. Buyers will get a great design with a powerful sprayer, one that is capable of 2.2 GPM in flow rate on average. And if you need sink space, the faucet rotates a full 360 degrees to clear the way for sinks that are smaller than average and need the space. Probably the best product in the young company’s lineup, VIGO really hits the mark with this kitchen faucet and really gives buyers something to clamor for. The only downside is the 1-year limited warranty, but other than that, this is a big feature commercial/fusion style faucet that deserves some serious attention. Give it a look if you want something a little different than the norm. Although the easy answer would be because they look cool and provide a bit more control over the normal kitchen faucet, the truth is a lot of people purchase commercial faucets because of the concentrated power. With the coil maintaining the weight and direction of the hose as you pull, consumers can get a spray of water that is powerful enough to wipe stains from dishes rather than just bathing dishes while leaving stains behind. This has been the biggest complaint of a lot of kitchen faucet users: that the included sprayer is not powerful enough for their needs. Commercial kitchen faucets have been around for a long time in big restaurants, and users can tell you how effective one is at blasting away stains and germs. Considering that it is also versatile enough to have a light touch, you have an all-in-one kitchen faucet that can handle small and big tasks. Consumers who swear by these models also claim that they are more durable than other kitchen faucets because they are designed like the bigger commercial kitchen faucets, so contain a lot of the same materials that make them last for years. There are also some cons to a commercial kitchen faucet that may make it a bit out of reach for some consumers that are considering taking the plunge. Commercial kitchen faucets don’t have a pull-down or pull-out spout; the spray head stretches, but it doesn’t have an attached hose that retracts when you’re done with it. So buyers used to Moen’s 60+ inches of braided hose will be pretty disappointed as the average stretch length of a commercial spout is about 8–10 inches long. This also brings into question the limited spray head functions on a commercial kitchen faucet, which is usually limited to 2 with the rare high-end model having 3 functions. Users that love to use the pause button on their spray head will miss that feature, although, to be honest, it is not needed on a commercial faucet since it doesn’t leave its base. One problem that has been solved with innovation is that commercial kitchen faucets are huge and don’t swivel, so they take up a lot of kitchen sink space. Thankfully, this isn’t the case anymore because many have 360-degree movement to give you full control of the sink. Like everything in life, pre-rinse faucets have both good and bad attributes that buyers need to be aware of before making their purchase. If you need one of these you may find the Pros far out weigh the Cons, however pre-rinse faucets are not for every kitchen. So, lets jump in and start with what’s to love about these faucets. These faucets deliver high-pressure water sprays from their spray head and typically come with levers or buttons to choose the pressure and temperature of the water. While they have been used in restaurants, they are becoming a popular addition in the home and look great in larger kitchens. You’ll also find these faucets do everything more effectively, whether it’s washing off your veggies or cleaning your dirty pots and pans—they’ll make this process go much faster. Just like typical kitchen faucets for the home, pre-rinse faucets come in several designs, types, color, and finish options to choose from (although lead-free brass is what they’ve typically been made of)—you’ll also find that there are button touch options that will simplify your life further. They are available in both wall-mounted and deck-mounted options, so you don’t have to sacrifice those choices. On the negative side, you’ll find these faucets were originally designed for restaurants and commercial kitchens, which means they are big. Unfortunately, because of their size, they aren’t compatible with smaller kitchens or smaller sinks that have limited space—in the end, even if you make it so one can be installed in a smaller kitchen, you’ll find it just doesn’t work with the smaller sink you ,ay have (these faucets work with deep sinks, as mentioned earlier). You will also find these faucets will increase your water bill if you don’t use them with an aerator. Overall, if you have the space, the right sink, and the need for one of these faucets then you will find they are a great option for you. Otherwise, you’re looking at something that may just be to large for your space. 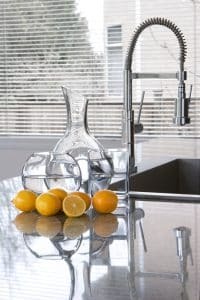 Why buy a professional kitchen faucet? These kitchen faucets are typically found in restaurants and commercial kitchens. They are incredibly durable, efficient, and designed to make your life easier. They are also meant to work with large, deep sinks without water splattering everywhere and are a great addition to the larger, modern kitchens that have become so popular. Professional faucets come in lots of design, style, color, and finish options—and, let’s face it, they look great. In general, their most affordable options are pricier when compared to smaller, affordable faucets but for the most part their prices are still comparable to most kitchen faucets. So, whether you are a professional chef or just someone who loves to cook, if you find yourself in the kitchen then you might just fall in love with these faucets. They are a perfect option for the perpetual party host, for large families, and for anyone who dies a lot of cooking—if this sounds like you then a professional kitchen faucet may be the way to go. Not only are they incredibly durable, but their high-pressure spray will greatly simplify your life—you’ll find yourself rinsing your veggies or washing all those dirty pots, pans, and dishes in half the time than you normally would. These sinks will pair well with a deep sink and a large kitchen, so if you have all that you may want to look into a high grade, professional kitchen faucets. Overall, buyers should consider a professional kitchen faucet if it fits their needs and their space. If you have a small kitchen, or spend minimal time in the kitchen, then this may not be the best option for you. You’ll find many of the brands that make these commercial style faucets are also well known for almost every other style of faucet—from techy to traditional, transitional, and modern designs. If you are looking for a commercial faucet for your business or space, then you know there are tons of options to choose from. With all the choices you have, it can be difficult to narrow down your options, which is why we have written a brief review on the most popular commercial style faucet brands.Below we will look at the Delta, Kohler, and Moen commercial faucet brands and why they are among the best to choose from. Delta is one of the most innovative brands when it comes to faucet designs, and this is no different when considering their commercial style faucets. Just like many of their other available faucets, Delta’s commercial collection looks great and is available in several design, style, color, and finish options to choose from. When looking at this brand’s faucets, you will find they have quite a few options available to choose from. Delta is an innovative brand, so they took the needs of everyone in mind and produce choices for each of those needs—so, there is something out there, regardless of what your personal budget, preference, or needs are. With these faucets Delta has employed their hands-free technology, trademarked as Delta’s H2O Optics. This tech provides the faucet with advanced sensing capabilities thanks to the use of infrared tech used to detect a person’s proximity. This also allows the faucet to respond much faster than others out there and compared to other commercial faucet brands, Delta is designed to respond much faster. Like everything, Delta commercial faucets are susceptible to damage overtime and will also need regular upkeep to keep it working at its best. Luckily, their faucets are designed with simplicity in mind—so they are easy to fix. This means you will just need one plumbing or service expert–so you do not have to deal with a bunch of different people coming in to fix your commercial faucet when something goes wrong. Overall, the Delta commercial faucets are an excellent choice if you are looking for a durable, innovative, and easy to use option. Its advanced sensing tech will greatly simplify your life and help you save water and reduce the spread of germs in your kitchen. Delta has lots of models to choose from and they make it easier with their SpecSelect catalog that will help you narrow down you on the specific features and specs you’re looking for. We highly recommend you take advantage of their SpecSelect feature since most brands do not offer this—it doesn’t filter your search, it helps you find your perfect faucet. Kohler is a well-known brand that most, if not every, buyer, has come across while on the hunt for the best commercial faucet for their space. With allof their products they offer several styles and types of faucets to choose from, along with a wide variety of finishes and colors—depending on the type and model you go with. However, when it comes to commercial faucets these options are a bit more limited when compared to their other faucet styles and types. Since Kohler consistently releases durable and highly rated faucets,it comes as no surprisethat this also applies to their commercial faucets. You will find this brand is a fair competitor to all other options, just at a more cost-effective price when you compare them to other top brands. If you are looking into Kohler you will find they feature several innovative designs and are available with several additional features, depending on your preference. While their commercial options are pricier than some of their other faucets, they are well-worth the cost. Kohler is currently shifting their focus so in developing more water conserving faucet—since more and more of us are looking for more eco-friendly options that will allow us to not only help the environment, but also reduce are water bills by decreasing our water waste. Another great feature they offer is their touchless design which allows them to reduce their water waste and decrease the spread of germs. They have accomplished this by accompanying a motion sensor that is only triggered when a person is close enough to use the water that is being dispensed. This touchless tech prevents the spread of germs since users won’t need to have to touch any levers or handles to activate the faucet. Kohler also offers several design and styles to choose from—although their commercial faucets aren’t as numerous as their other types. You will find you can choose between wall-mounted and sink mounted faucets—both of which are great, and your choices just depends on your own personal preference, needs, and budgets. Overall, Kohler produces high-quality, commercial faucets to choose from that are built to last and come at more cost-effective prices. It can be daunting to choose the right faucet, but Kohler makes it easy by only providing great options to choose from—so the process doesn’t have to be as difficult as we expect it to be. While Delta and Kohler are among two of the best commercial faucet brands out there, Moen does not fall short in comparison. Moen is one of the best brands and well-known in the industry thanks to the high-quality, durable, and effective commercial faucets they produce. If you are looking for a faucet that looks and works great, then Moen is a great way to go. Regardless of your business or space, Moen offers several commercial faucets to choose from—all of which you will find to be some of the best out there. Compared to other brands, Moen has fewer design and style options to choose from—with most of their commercial faucets being sleek and simplistic in design. You will find their faucets are easier to sift through and narrow down while shopping. The best part about Moen’s commercial faucets is the use of their M-power sensor tech. This allows them to conserve more water and reduce the spread of germs at the same time. While not all their commercial faucets employ this feature, those that do are among the most popular they have available. If you are looking for handle or lever faucets, those also come highly-rated as well. One of the best parts about this brand’s commercial faucets is that they are easier to maintain and pretty easy to fix when something goes awry. Their parts are easy to get a hold off and you don’t have to hunt them down from online retailers for those simple fixes or maintenance upkeeps. Overall, the commercial faucets produced by Moen are just as durable, effective, and efficient as those from other brands. While they have fewer design, color, and finish options to choose from, their options still look great and get the job done. Moen has proven that all their products are a great addition to your home or space—whether you are looking for a commercial faucet, kitchen faucet, bathroom faucet, or other fixture or accessory from this brand. When it comes to size, commercial kitchen faucets are bigger—and bigger isn’t always better when it comes to your kitchen faucet. This is because a larger faucet will require a larger sink and a larger space—if you don’t account for this you may end up with a comically large faucet that splatters everywhere since your sink isn’t deep enough. However, if you have the space for it, commercial kitchen faucets are popular in modern kitchens—and their functionality makes them well-worth their cost. So, before making your decision make sure to keep in mind the overall functionality the faucet will bring you—no matter how in love you are with the commercial kitchen faucet you have been eying. On the other hand, when looking at color and finish you will find you still have a lot of options to choose from—all they may be limited depending on the brand and model you are considering. While lead-free brass will make up most of your options, you will be happy to find that many brands offer more selections to choose from so the sink matches your kitchen perfectly. This is a pretty big list with a lot of great products, so with luck one of them caught your attention. Commercial faucets built for residential homes are here to stay, along with their many fusion and mashup styles. If you’re in the market for a kitchen faucet that has a lot of power and can handle anything you throw at it, then don’t shy away from this style — it’s exactly what you want.